“What happened in Anchorage was an emotionally disturbing event, a lot of people were very scared," state seismologist Michael West said. Near the quake’s epicenter on Point MacKenzie, the shaking started as Gary Foster was getting his 7- and 10-year-olds ready for the school bus. The house went dark. Foster grabbed a light and raced up pitch-black undulating stairs to grab his 5-year-old daughter in a second-floor bedroom before running back down, the whole place still gyrating, and outside with his family. Gov. Bill Walker issued a declaration of disaster Friday morning that was approved Friday afternoon by the Federal Emergency Management Agency. The quake inflicted serious structural damage on roads and bridges throughout the region. Some roads, especially in the Mat-Su, remained impassable Friday afternoon. 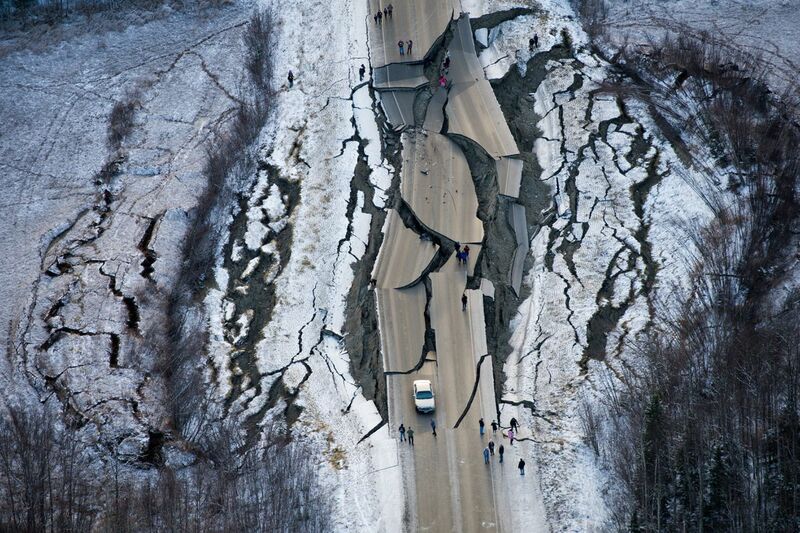 Schools in Anchorage and Mat-Su are closed until Wednesday so officials can check for damage. The city of Anchorage declared a civil disaster declaration to access state resources, Mayor Ethan Berkowitz told reporters Friday. “The amount of infrastructure damage has been mitigated in large part by how we build things here and the level of preparation,” Berkowitz said. 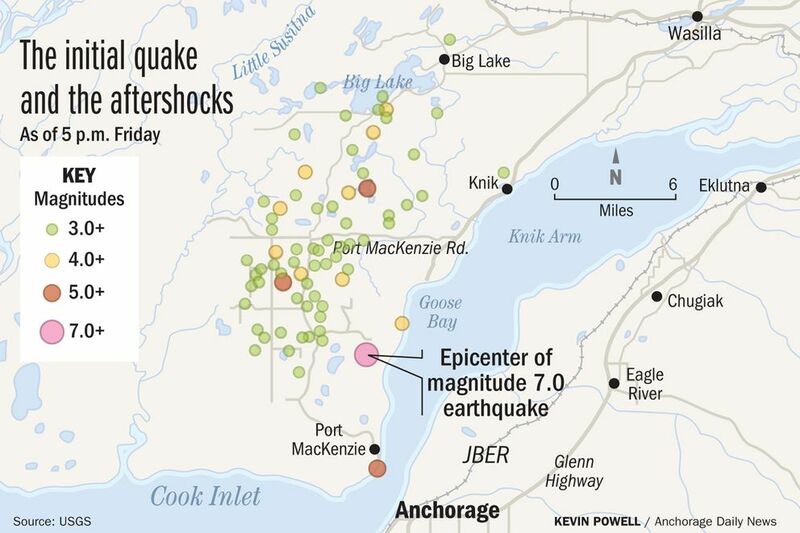 The quake spawned more than 200 aftershocks in 12 hours, including a sharp jolt felt widely in Anchorage around 10:26 a.m. and another series of aftershocks just before 11 a.m. At least four of the aftershocks were 5.0 and one measured 5.7. Lighter aftershocks continued to be felt through the afternoon and evening. The earthquake shook buildings violently, cracking walls, making some store floors a mess, and leaving office desks covered with dust from shaking ceiling tiles. Home chimneys crumbled, garages collapsed, and household items shattered on the floor. A tsunami warning for Southcentral Alaska including Kenai, Kodiak and the shores of Cook Inlet was canceled around 10 a.m. The trans-Alaska pipeline was shut down as a precaution, according to Alaska Pipeline Services. It was restarted Friday afternoon. Hospitals in Anchorage canceled elective surgeries and kept only emergency rooms open. Mat-Su Regional Medical Center remained open. 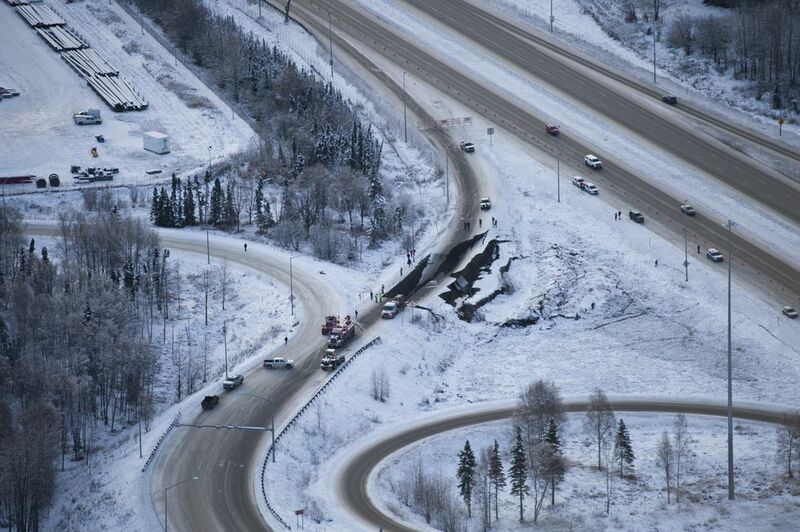 The Glenn and Seward highways in town reopened early Friday afternoon, according to an update from Anchorage police. But detours and delays continue. Damage was a moving target, with new updates still coming in Friday evening. “This was a big one,” DOT spokeswoman Shannon McCarthy said. Other closures included periodic detours at Knik River Bridge; detours on Dowling Road at C Street due to a large crack in the roadway; and detours on Eagle River Loop Road at Mills Bay Drive due to a sinkhole. The Seward Highway south of Anchorage was closed at Mile 112 — McHugh Creek — in both directions because of a rockslide but reopened by Friday afternoon. The Federal Aviation Administration control tower at Ted Stevens Anchorage International Airport was not allowing arrivals as of noon Friday, FAA spokesman Allen Kenitzer said in an email. By early afternoon, the stoppage was lifted and both arrivals and departures were allowed. Anchorage fire chief Jodie Hettrick told reporters on Friday morning that visitors to Anchorage should prepare to stay with family or friends Friday night, as well as residents without power. Four emergency shelters have opened in the quake’s aftermath: at the Egan Center in downtown Anchorage, the Chugiak-Eagle River Senior Center, the Curtis D. Menard Memorial Sports Center in Wasilla and the Girdwood Fire Department. Anchorage and Mat-Su fire crews responded to a number of fires and collapsed buildings after the shaking stopped. There were four structure fires in Anchorage, and Hettrick said she was still getting details on the collapsed buildings, but they appeared to be smaller structures. Officials with the Anchorage Water and Wastewater Utility also reported more than two dozen pipe breaks throughout the city. The utility fielded about 70 requests to turn off residential water service because of flooding, officials said. Anyone who notices major structural cracks in their home should evacuate, Hettrick said. The Alaska Railroad shut down all operations due to severe damage at the railroad’s Anchorage Operations Center on Ship Creek, including the dispatch center, according to spokesman Tim Sullivan. The center is closed by flooding from burst pipes and the power is out. The Southcentral Alaska gas utility, Enstar, had received more than 300 reports of natural gas leaks by late afternoon, officials said. Utilities planned to work into the night to restore service to customers. Matanuska Electric Association, based in Palmer but with members to Eagle River, reported 50,000 members without power just after the quake. Chugach Electric Association reported more than 8,500 without power initially. The power stayed on at the University of Alaska Anchorage, but the campus was closed as was Mat-Su College. All Southcentral jails were operating on generator power in the hours after the earthquake. The Anchorage jail complex and Hiland Mountain Correctional Center in Eagle River both had water line breaks that caused a temporary shut off all water, according to DOC spokeswoman Megan Edge. Hiland was also without heat for much of the day. By Friday evening, the heat was back on at Hiland except for in two housing units, said Edge. The facilities were considered “safe and secure,” she said. Alaska postal officials announced a temporary suspension of mail delivery and retail operations in Anchorage, Eagle River and Wasilla due to the earthquake, according to an announcement Friday afternoon. Some deliveries were made across the area, but delivery operations were suspended at the request of state and local emergency operations. People Mover suspended service as a precautionary measure due to the earthquake, but planned to restore service Saturday. All rides will be free Saturday and Sunday. Alex DeMarban, Annie Zak, Marc Lester, Madeline McGee, Loren Holmes, James Brooks, Matt Tunseth and Julia O’Malley contributed to this story.